Gardeners can be conservative or adventurous, traditional or daring. The conservative or traditional gardener chooses plants they know will grow well in their garden. The adventurous or daring gardener wants to push the limits and grow plants that are not commonly found in their area. For these gardeners success (and failure) is part of the fun of gardening. Both types of gardeners can benefit from understanding zone maps and hardiness ratings. A hardiness rating is based on a map developed by the U.S. Department of Agriculture. First published in 1960, the map divides North America into 11 hardiness zones. Each zone is determined by a 10-degree Fahrenheit difference in the average minimum temperature. Zone 1 is the coldest and Zone 11 has the warmest winter temperatures. A plant listed as hardy in Zone 4 indicates it should survive winter temperatures as low as 30 degrees below zero F., which is the average minimum winter temperature according to the USDA map. A Zone 9 plant is hardy only to 20 degrees F. Some references provide a range of zones in which the plant will grow. A plant listed as hardy in Zones 4-9 means it will grow in all of those zones. However, there are many factors that affect a plant’s ability to grow in a particular climate including exposure, altitude, moisture, soil type and even snow cover. These conditions create variations between and within zones. While it’s unlikely that a plant listed as hardy in Zone 7 (the primary zone for the Triangle) would survive in the colder Zone 4, you may be able to grow plants recommended for warmer zones. Your garden may have a microclimate that’s not typical of the actual zone where you live. Variations in temperature, moisture, soil and light can be used to place plants where they have the best chance of growing. Trees and buildings provide from strong winds, while south-facing fences and walls absorb heat to create a warmer microclimate. You can give plants special attention to help them survive out of their recommended zone. A gardener living in Zone 5 might be able to grow Zone 6 or 7 plants if their garden is in a protected location or they provide extra care, such as growing the plants in a warm south-facing garden or covering them with mulch in the winter. Another option is to move plants into an unheated garage or other protected location that doesn’t get as cold as the outdoor temperature. While cold temperatures can damage plants during the winter months, extreme periods of heat can injure plants while they are actively growing during the summer time. 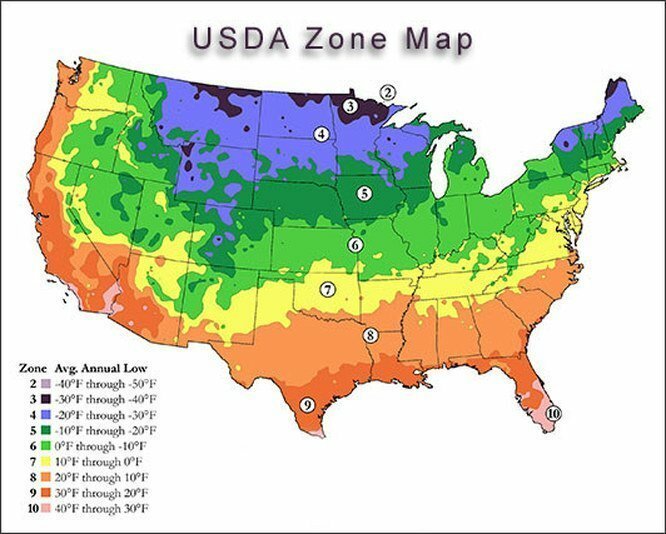 In 1997, the American Horticultural Society developed a Heat Zone map that divided the U.S. into 12 heat zones. Each zone indicates the average number of days that are greater than 86 degrees F., the temperature at which plants start to suffer damage from high temperatures. Zone 1 has the lowest number of heat days and Zone 12 has the highest number. While not used as often as the hardiness zone, it is still a valuable tool when choosing plants for your garden. In addition to reference books, local garden centers and county extension offices can help you identify your zone information. To find your hardiness zone by using your zip code check the National Gardening Association’s website under the Reference section. To find your heat zone check at the American Horticultural Society’s website under the Gardening Q&A section, Heat Zone Finder. No matter what type of gardener you are, knowing about hardiness and heat zones can help you make the right selections for your garden.